When Mitchell Zephier creates his unique pieces of art-quality jewelry, he begins with the gifts of the earth: silver, copper, stone. He embellishes his work with vestiges of earth’s creatures: creamy bone, polished black buffalo horn, pale Mother-of-Pearl shell. He cuts the shapes of his pieces from the flat sheets of metal and lays them together layer on layer colors and textures showing through where the designs are cut outlining birds and animals and mystery. His success is notable. His international recognition is gratifying. But, that is only half of Zephier’s story. What he is creating behind the scenes is something large, a permanent gift to his people. 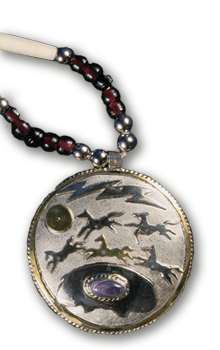 His jewelry style is based on Northern Plains Indian cultural symbolism and cultural values. Bravery, generosity, respect for motherhood and the elderly are expressed in his designs. “One of the fascinating things about this jewelry, many times it is just decorative and functions as jewelry; but more often than not, it transcends being just jewelry. Then it conveys a legend or cultural concept,” he said. It is a way of sharing his culture, he says, mentioning that his give-away horse pin. “Why a give-away horse?” he asks with a smile, like a good teacher about to reveal a new level of understanding. “One of the four cardinal virtues is generosity. The horse embodies the Lakota concept of generosity. It is considered a gift from Wakan Tanka, the Great Spirit. The name for the horse is Shunka Wakan, sacred or mystery dog." The horse was considered the ultimate gift; often given to honor a son who had killed his first buffalo or a man who had done a brave deed. Over the years, other Sioux jewelers have opened shops of their own. Zephier said he trained most of them. Now, these young men are training their own apprentices. In a historical context, 20 or 30 years down the road, this could blossom into a whole range of creativity and employment. *Article and information provided by artist as published in the Summer 1991 issue of Inside the Black Hills. Zephier's artwork is available through the Akta Lakota Museum online gallery.